“Plate tectonics” – “Plate” a geologic term for large slab of rock, and “Tectonics”, part of the root in Greek for “to move” – put them together – suddenly ocean currents, weather patterns, and an average global temperature of 54 degrees Fahrenheit start to make sense. Science accepts the theory of moving plates of rock – 7 major and over a dozen minor plates, making up the Lithosphere. A 100 Kilometer deep (give or take, here and there) outer crust floating about on hot layers of upper mantle. Tectonic plates couldn’t exist without water. As our world took shape billions of years ago – water was the single factor capable of setting life in motion – accretion settled down, planet Earth announced she was here to stay – it was water that set our unique set of circumstances in motion. There’s a lot of it beneath the surface – perhaps as much as an entire ocean – pooled, saturating, running and generally messing around with otherwise solid stone. Our planet was precisely the proper size to form and cool – not too fast, not too slow, but just right. Mars tried to develop tectonics, science speculates it had an atmosphere and magnetic shield for a cosmic blink, but ultimately proved too small (hence cooled to fast) to make it in the long run. Plate tectonics are tricky – on Earth they are credited with formation of mountain ranges (the Andes and Himalayas for instance), geographic barriers responsible for trapping moisture, continental drifts and collisions (Antarctica separating from Australia – hence redirection of ocean currents) or volcanic eruptions which released trapped carbon dioxide gas leading to global warming. Plate tectonics are the reason we have earthquakes – ever drifting sections of the planet grind against each other, exert unimaginable pressure as one plate attempts to overtake another – inevitably very bad days follow. Earthquakes, volcanic eruptions, monsoons, hurricanes – all products of our unique tectonic designation. I could write pages about Earthly tectonics, but ask you trust me when I tell you – they are the reason we exist. At the moment, I have Europa on my mind. Europa is the 6th closest of Jupiter’s 63 moons. It caught Galileo’s attention in 1610 (a ponder in itself – why this moon Galileo?). Of interest to NASA since the early 70’s, modern science suspects Europa’s smooth icy surface hides a liquid ocean – data from the Hubble telescope indicate “plumes” of water vapor spewing from a suspected underground source. Earlier this week, researchers S.A. Kattenhorn and L. M. Procter published findings culled from Hubble images indicating tectonic movement on Europa. Using images from Hubble, they concluded Europa’s surface appeared to move about, much like our own – a conclusion with only one explanation – plate tectonics. Plate tectonics rely on water, water is the one and only constant needed to support life. We’ve long believed Earth was unique regarding tectonics and the ramifications of liquid water in relation to supporting any form of life. Pondering Europa as a planetary body with plate tectonics means it’s possible life exists beneath the surface. NASA’s Jet Propulsion Laboratory has conceptualized a mission dubbed “Europa Clipper”, with an optimistic launch in the next 10 years. 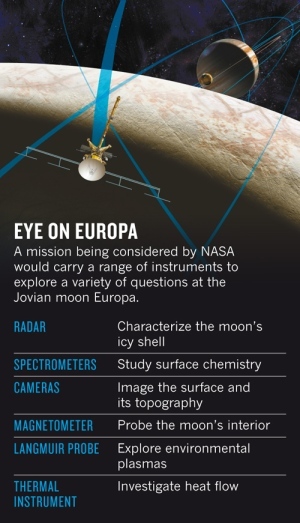 Despite a daunting 2 billion dollar price tag, NASA is asking the scientific community to submit suggestions by October 17, 2014 for instrumentation or investigative approaches to determine once and for all if Europa has what it takes to support life. “Life” is complicated. Plate tectonics may be tricky, yet one thing remains unshakeable – life exists on Earth due to tectonics – we owe it to ourselves to investigate that possibility on Europa.